more on the li' bugger~ - A mummy's inane blabberings..
We were on our way to the hospital to visit Jinny, who had just given birth. 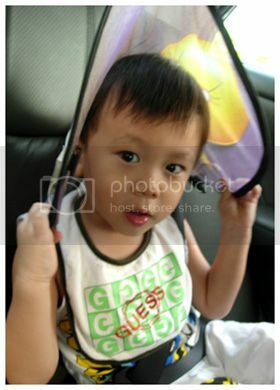 While in the car, Aidan requested for the window sun shade so I handed it over to him. 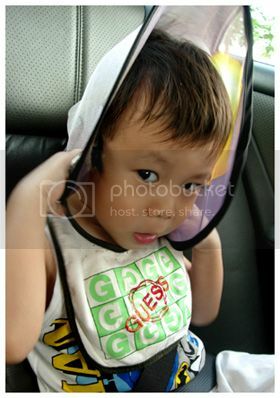 He then unfolded it, twisted it abit, placed it over his head, turned to me and squealed "Mummy, see! Hat!" I hope I haven't been making Aidan seem like a brat. He really isn't. He is a sweet and good-natured boy and he's usually quite well-behaved. Even as a newborne, he was such a easy baby to care for, sleeping through the night at 2 months old..Hm, actually, he slept alot when he was a baby..hence i didn't have that much to do as a sahm, which was probably why I blogged alot then. He's always been a sociable kid, doesn't have much problems with strangers (which can be worrying at times 'coz he'll adopt you if you offer him sweets), very independent and isn't very clingy at all..That's why many people had said that he takes after me more than hubby. God is fair. He may look like hubby but he has my personality :D~! We never have any problems with him in the car, even when he was a baby. He doesn't mind sitting in his child car-seat and in fact, he usually scampers into it enthusiastically and will demand that we buckle him up prompto. Today, while we were in my in-law's car, he sat behind with me as we didn't install the baby carseat. And he still demanded to be buckled up. 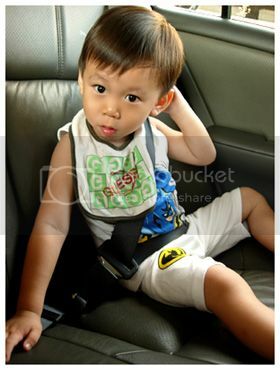 Actually, he first pointed to my seat-belt and instructed me to belt up first! Wah..fierce man! And since young, he's been such a great eater. He wallops up his milk like there's no tomorrow and I had no problem introducing solids to him too! Most parents are worried that their kid isn't eating enough. I worry that he eats too much! And he still isn't slowing down at this age..But thankfully, he's such an active boy and I guess his metabolic rate is quite high so he doesn't put on much weight. 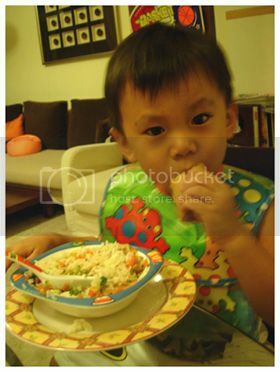 Aidan having his dinner this evening..
and they weren't teeny-weeny spring rolls hor! His speech & understanding of words has improved too. I have to give credit to dad-in-law, who's been giving him 'writing test' and reading him his favourite books every afternoon. He's able to identify all the alphabets & numbers now..Dad teaches him in an interesting way..by making him read out the number plates of cars at our carpark and the signages when he brings Aidan out for walks. Yeah..got rapped by Jean for lamenting that Aidan's rather slow in his speech development. I know I shouldn't have harped on it that much before..and I must not compare him with other kids. He is developing well at his own pace & time and I have to learn to just let him enjoy his childhood and not be such a worry-mommy! Gotta constantly remind myself! 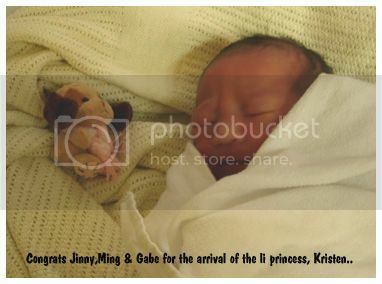 And here's the new baby on LJ :) Kristen looks like Gabriel when he was a baby, doesn't she? Congratulations Jinny!! Little Kris is so pretty! Oh my! How time flies! I remember popping by Jinsiew's LJ some time back and she just discovered she was preggies. And now, Baby Kristen's born already! Gosh! And she looks so sweet! yeah..i said the same thing to Jinny too..it seemed like just recently that she'd told us she was preggy and now, Kristen has arrived already. How time flies! 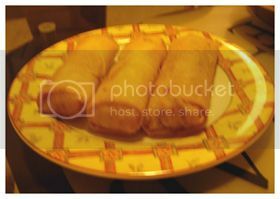 I go find u tomorrow ah. Should be there late morning/early afternoon! aha...why isn't Aidan in a booster seat? I bet you Aidan is definitely eating alot MORE than me! heh..coz we havent bought one for him. It just occurred to us we should get him one now that he's grown so much. haha... Ethan also likes to play with the window sun shade. He will do like what Aidan did, making a hat. He also shows me how he 'make' butterfly. Well, that's why in your previous entry I commented your Aidan is really an easy child. You are so lucky! You're probably see Kristen soon since u guys go out so often..and it's the Octobabes birthdays soon too hor! Man...our boys are gonna be 3 year old soon! That is one helluva large bowl of food. I think he eats double Alison's intake! he eats like an adult lah..Most of the time, he eats abt one and a half bowl of rice..that day was different becuz he had the spring rolls..
what what..cute mah (not cross-dressing hor)..
yeah he is..isnt he. YC's parents are great lah! from the picture it looks like the seat belt fitted Aidan just right - so he must be quite tall now. Must get a comfortable booster seat. Most look very hard and stiff. it does cut into his neck a li'..so he definitely needs the booster seat. Agree with u that most look quite hard. Am going shopping for it this weekend! 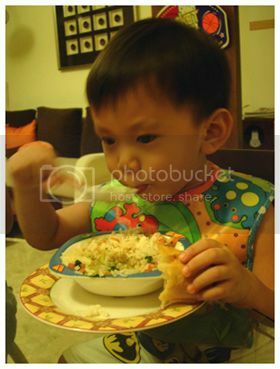 He eats more than me, and that is double of Nana's portion! U've been really blessed to have such an easy going child. And you have a wonderful dad-in-law too! and you're right..my in-laws are great. Mom-in-law too. She always comes by after work to be with him and bring him for walks. That's why he's so close to them. I can't believe that such an easy child as Aidan exists! Baby Karu is the exact opposite! The worst is that he hates his car seat and I am always stressed out driving. My blood pressure increases every time I have to go out as it means non stop crying and I have to stop ever so often at petrol stations, car parks etc to calm him down! by the way, does that sun shade thingy that Aidan made into a hat good to get the sun out of his eyes? was thinking of getting one. Hmm..not all kids take to the baby carseat..i guess they find it restrictive but i think it's still quite impt to strap your baby up..even if you arent driving. Hope he'll get used to it after a while..
You are indeed blessed to have such an easy kid, such an envy to many mothers, me included. Aidan has never come across as a brat. I am always amazed at his appetite and envious of his love for food. You have a great child there.